The 2000 Guineas at Newmarket is a fantastic curtain-raiser for what should be an outstanding Bank Holiday meeting. For anyone who followed last season’s juveniles, this will be one of the most important racing days of the year. 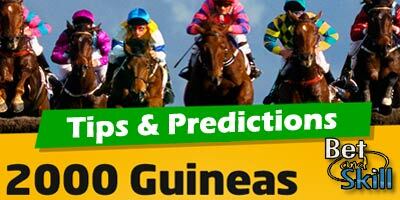 This article contains our 2000 Guineas betting preview with betting tips, expert predictions, enhanced odds, bookie offers and no deposit free bets! The standout juvenile colt of 2015 was, unquestionably, AIR FORCE BLUE who won 4 of his 5 races, including the Phoenix Stakes and the National Stakes. He trounced Massaat in the Dewhurst here in October having comfortably beaten Herald The Dawn in the National Stakes at the Curragh earlier. His only defeat came at the hands of Buratino, in the G2 Coventry Stakes. Unsurprisingly, Aidan O’Brien described him as one of the best two-year-olds he has ever had. STORMY ANTARCTIC took the honours in the recent Craven Stakes, which is also ran over this Rowley Mile. He burst a few bubbles that day and the pace he showed to sweep to the front and end the race as contest was particularly eye catching. GALILEO GOLD won the Vintage Stakes at Goodwood last summer and then ran very well in Grand Criterium at Longchamp. An impressive result given that the race did not pan out too well for him. Furthermore, the course and ground probably did not play to his strengths either. On a more galloping track where he should get an even pace to run at, it looks like he can run to a better level. MARCEL is a former Group One winner as he landed the prestigious Racing Post Trophy at Doncaster, a performance which puts him second behind only Air Force Blue on Timeform ratings. He triumphed by a length and a half at odds of 3371 and only Foundation could have any excuses. BURATINO is the only horse to ever beat Air Force Blue. He proved himself to be a remarkably durable performer when posting a career-best on Timeform ratings (118) to chase Shalaa home in the Middle Park. Buratino is yet to finish outside of the money places in eight starts and tends to perform most admirably on quick ground. RIBCHESTER is a horse with a similar profile to Buratino in that the Guineas trip may stretch his stamina. He really impressed in the Mill Reef Stakes at Newbury last season and at least has the scope to improve this season. HERALD THE DAWN was a sound 2nd behind Air Force Blue in the National Stakes on ground that was too soft for him. He was easily brushed aside by him that day, but he at least has form behind the race-favourite and if not running too keen early, could run into a place. The likes of Zhui Feng, Zonderland, First Selection, Kentuckyconnection and Air Vice Marshal appear to be a bit below the required standard. Price boost: 5/1 Air Force Blue to win! Was 8/11! "2000 Guineas predictions, betting tips, odds and free bets (Newmarket - 30th April 2016)"